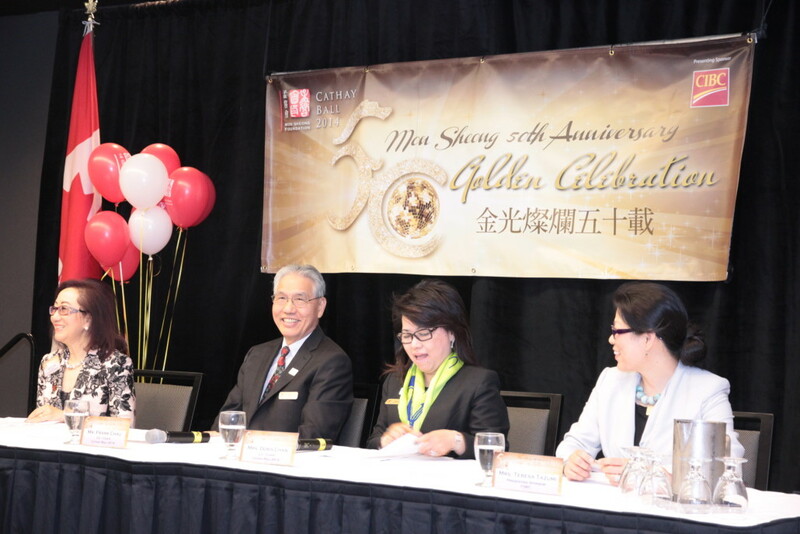 TORONTO, October 2, 2014—Mon Sheong Foundation is pleased to announce the theme for the 23rd Annual Cathay Ball, “Mon Sheong’s 50th Anniversary – A Golden Celebration”. The event is presented by CIBC and will be held on the evening of Saturday, November 1st at the Metro Toronto Convention Centre. All of the proceeds from the annual signature fundraising event will be used to support Mon Sheong Foundation programs. The Co-Chairs of the 2014 Cathay Ball are Mrs. Doris Chan, First Vice-Chairman of Mon Sheong Foundation; Mr. Frank Chau, President of Mon Sheong Foundation; Mr. Eddie Tsang, First Vice-President of Mon Sheong Foundation and Mrs. Jo-Cy Lee, Director of Mon Sheong Foundation. 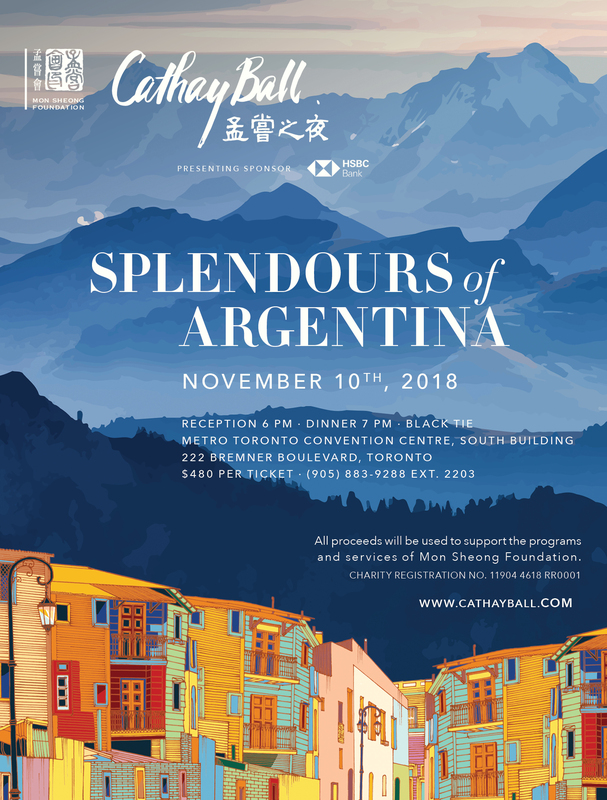 It is also our privilege to have Mrs. Vivienne Poy as our Honorary Chair of the 2014 Cathay Ball, Mrs. Vivienne Poy will also be attending the gala in support of Mon Sheong Foundation. “We are honored to have our Presenting Sponsor, CIBC and all of the sponsors which have helped ensure Cathay Ball a great success. The Event Committee chose “Golden Celebration” as the theme for this year’s gala commemorating the hard work and restless effort of Mon Sheong’s predecessors. They have earned the support and identification from the government and the community by caring for the elderly and nurturing the young. Following their footprints, we promise to try our best in providing diversified services to meet the needs of the community. Following the completion of Mon Sheong Care Complex in Richmond Hill, our eagerly anticipated Private Care services has started to operate and the Charity Care services will soon be launched. Without any government funding for these two projects, may I ask for your generous support to help cover the high operating expense so that we can keep on providing quality services for the community. In addition, we will have a photo exhibition with a collection of memorable moments throughout the past 50 years of Mon Sheong Foundation’s history. These photos not only recap the precious stories of Mon Sheong, but also provides insights into the many special initiatives of the organization. At the end of the exhibition, guests will have a chance to win a cruise vacation for two by collecting all five exhibition stamps and entering it into the lucky draw” added Mr. Frank Chau. “We would like to thank the genuine support of our sponsors and donors. This year’s silent auction will have more than 100 carefully selected gifts ranging from jewelry to fashion items. The breathtaking special draw will be introduced again and will split into a male and female draw, with tailored made prizes for each winner. It will be an unforgettable evening for us all,” said Mrs. Jo-Cy Lee. More than 1,000 guests including senior government officials, politicians, community leaders and celebrities are expected to attend this glamorous black-tie gala. Cathay Ball 2014 would not be made possible without the support from all its sponsors, including Presenting Sponsor – CIBC, Diamond Sponsor – MediSystem Pharmacy, Gold and Printing Sponsor – Four L Graphics, Gold Sponsor – BMO Financial Group and many others. The organizing committee of the 2014 Cathay Ball thanked all of the sponsors for their continuous support, enabling Mon Sheong to continue to serve community with quality services. The public can support Mon Sheong by buying Mon Sheong Foundation Charity Raffle tickets, which are available at $10 per ticket at various Chinese malls on scheduled dates, as well as Mon Sheong’s three Long-Term Care Centres, two Community and Volunteer Services Centres, and Mon Sheong Court. The prizes for Charity Raffle 2014 include: Grand Prize –Samsung 60” 1080p Smart TV (Value: $1,512); 2nd Prize (2): LG 60” Plasma TV (Value: $1,173); 3rd Prize: Onkyo Home Theater System (Value: $685);4th Prize (2): Nikon D3100 DSLR package (Value:$530);5th Prize(3): Samsung Galaxy Tab3(Value:$452); 6th Prize(4)：NVIDIA SHIELD Portable Handheld Android Gaming (Value:$315);7th Prize(2):Panasonic Fuzzy-Logic Electronic Rice Cooker(Value:$113);8th Prize(10): Sennheiser In-Ear Sports Headphones(Value:$ 113); Prizes are donated by Canada Computers. Cathay Ball dinner tickets are available at $400 per person and $4,800 per corporate table (for 10 guests). For enquiries or purchase of dinner tickets and raffle tickets, please contact Mon Sheong Foundation at www.monsheong.org or call 905-883-9288 ext. 2203 or toll-free at 1-866-708-0002.